A fascinating little museum containing lots of information about the origins and uses of tobacco (did you know it was a sacred medicine of Aztec gods) and a wide assortement of pipes . 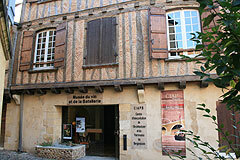 This museum also houses information about Bergerac's history. 4 euros adults, children free. Housed in the vaulted cellars of the Presbytere Saint Jacques in the centre of Bergerac this museum contains works by the sculptor Constantin Papachristopoulos known as Costi. In total there are 52 bronze statues as well as some other works. Opening hours: July and August only. Museum of wine and the importance of the river to Bergerac's trade and history. With items related to wine production and large scale models of the boats used to transport the wine. A collection of paintings and engravings by Fernand Desmoulin. A visit to the museum can be combined with a visit to the troglodyte abbey of Brantome. Opening Hours: The Abbey is generally open 10.00-12.00 and 14.00-17.00 and closed Tuesdays though these times are extended during some months. July and August the abbey is open every day 10.00-19.00. This museum is in the Château de Castelnaud and is well worth a visit. The château, the views and the museum all contribute to make this the most visited chateau in the midi de la France area. The museum contains a great collection of weapons and armour with life size modes of large weapons. Great for children and grown-ups. 500 objects put on display by one of Napoleon's direct descendents. 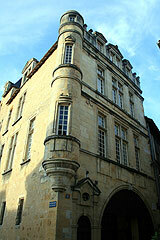 The museum is in the attractive chateau de la Pommerie and so you get chance to see the chateau at the same time. Adults 7 euros and under 12s free. This is a working paper mill allowing you to see paper being made. After learning about the process there is a shop where you can buy samples of this very attractive paper. Opening Hours: Monday to Fridays (except bank holidays): 9.00-12.00 and 14.00-17.00. Near to the Chateau de Jumilhac this Museum of Gold which tells of the history of gold mining in the region. With various exhibits, a part of a mining gallery and even the chance to go panning for gold in the Isle river. The museum is open July and August only. An archeological collection tracing 400 thousand years of human life. 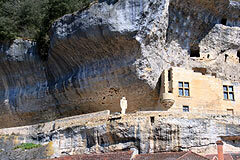 The museum is in the village of Les Eyzies set in the rock face above the village. Adults 5 euros, under 25s from the EU free. This museum designed by the internationally renowned architect Jean Nouvel is situated close to the tour de Vésone at the heart of Perigueux old town. 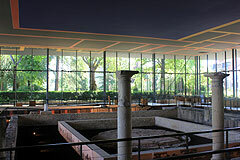 Exhibits of the Gallo-Romaine era. Closed 1 Jan, 1 Nov, 11 Nov and 25 Dec.
Set in an attractive 19th century building in Perigueux, the museum houses exhibits of pre-history, gallo-romaine, mosaics, paintings, sculptures and much more. A collection of ancient postcards is on display in this museum in the small but pretty village of Saint Pardoux la Riviere. A collection of vintage cars and motorbikes as well as tools and farm machinery from days gone by. This museum is set in the natural rock fortress of Tayac. There is a display of potholing tools and information about the formation of caves.